Prof. Kim Won-yong and Prof. Lim In-seok of Chung-Ang University (CAU)’s College of Medicine (Dpt. of Microbiology and Dpt. of Pediatrics & Adolescent Medicine, respectively) revealed that a growing number of people are infected with a new type of rotavirus, G2P, generated through re-assortment between animal and human strains. Rotaviruses are known to cause acute gastroenteritis in infants aged five or less, accompanied by vomiting, fever, diarrhea, and dehydration. As a matter of fact, the World Health Organization (WHO) has designated rotavirus diseases as one of the most critical infectious diseases that need to be eradicated in an urgent manner. With the introduction of two global rotavirus vaccines, RotaTeq in 2007 and Rotarix in 2008 in Korea, the attack rate has been gradually on the decline. CAU’s research team, through an analysis of 1,126 pediatric patients with acute gastroenteritis who had been treated by CAUH’s Dpt. of Pediatrics from 2013 to 2015, discovered that G2P contained in rotavirus vaccines is most prevalent in those patients, and 11 RNA segments of rotaviruses are produced via re-assortment events with bovine animals such as cow, bison, and goat. These findings will contribute to identifying the pathological mechanism of rotavirus diseases developing in pediatric patients already vaccinated against rotaviruses; further advancing research on interspecies transmission of new & variant viruses; and ultimately developing a noble rotavirus vaccine. 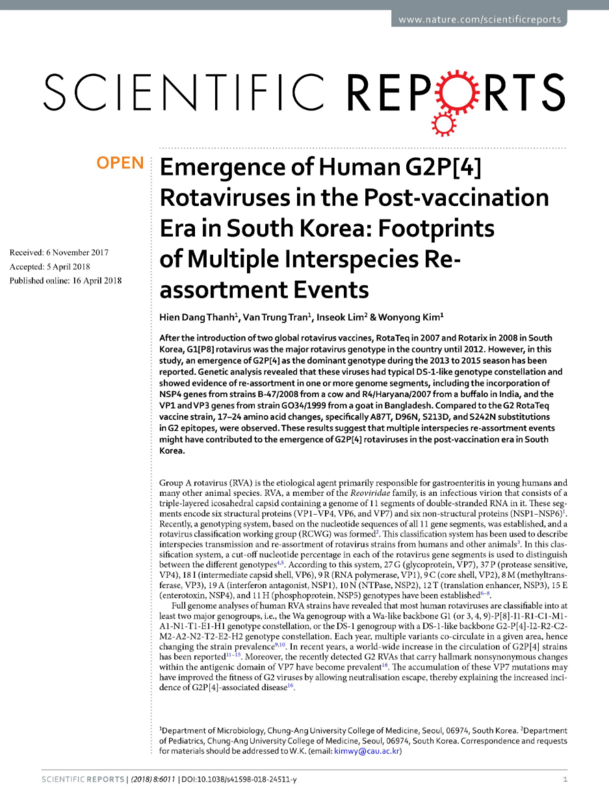 CAU research team’s paper entitled “Emergence of Human G2P Rotaviruses in the Post-vaccination Era in South Korea: Footprints of Multiple Interspecies Re-assortment Events” was published on Scientific Reports, an online journal published by the Nature Publishing Group, on Apr 16th, 2018.